Uncategorized | Dorothy Day Catholic Worker Washington, D.C.
Voices for Creative Nonviolence supports an initiative of the Afghan Peace Volunteers in Kabul: warmth and work. Children are vulnerable to freezing in the refugee camps and other impoverished areas of Afghanistan; 100 froze to death last winter. Women are without work and need income to feed their families. It works this way: each morning at 8 am, 26 women gather at the home of the Afghan Peace Volunteers to collect materials for making special thick quilts, called duvets. In their homes, they and their families make the duvets, stuffing wool into coverlet material hand sewn on each border, and deliver the finished products the next day. 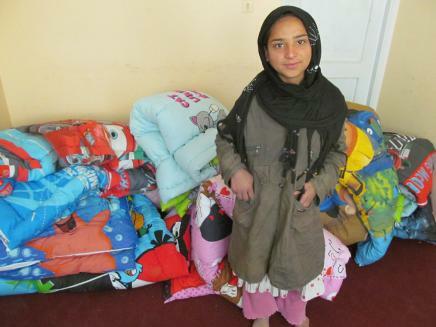 With the help of the volunteers and Afghan families, the quilts are then given to families who need them. It costs $20 to make each duvet. This sum can bring work and warmth to brothers and sisters in need; life to children and women alike. To donate to the Duvet Project via PayPal, sign into your PayPal account and submit the funds to email identity “theduvetproject@gmail.com”. One-hundred percent of the funds go directly to the Duvet Project of the Afghan Peace Volunteers.